Mr and Mrs Sharp are walking along the beach. 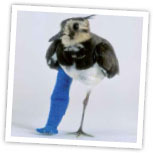 Suddenly, Mrs Sharp sees an injured bird on the sand. “Ah, look. A poor little birdie that can’t fly.” “Where?” says Mr Sharp, as he looks up into the sky.